Arthritis has several names — degenerative joint disease, osteoarthritis — but, whatever you call it, your horse has stiff and painful joints. 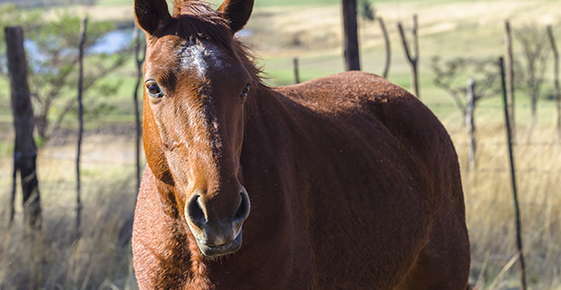 This common chronic condition often affects older horses, as the cartilage around their joints deteriorates, especially around their knees, coffins, fetlocks, hocks and pasterns. Arthritis often causes lameness. Joint trauma is the leading cause of arthritis. This can mean the repetitive stress of years of hard work. Infected wounds can cause an acute type of degenerative joint disease called septic arthritis. The most common symptoms of arthritis are swollen joints, stiffness, uneven gait, shortened stride and lameness. Your horse may be unable or unwilling to keep up with your demands. Jumpers may no longer want to stop or turn. Veterinarians diagnose the presence and degree of arthritis by physical exam, lameness exam and X-rays. Arthritis is not curable, but people manage the disease in many ways, depending on its severity. Medications and supplements, such as non-steroidal anti-inflammatory drugs, glucosamine or hyaluronic acid, may be used to manage arthritis. Curcumin, the active ingredient in turmeric, may help decrease joint inflammation. Injecting stem cells directly into affected joints is a newer technology that some veterinarians offer. Some researchers are investigating alternative management methods, such as aquatic therapy. Scientists at Colorado State University have studied the effects of having horses walk on an underwater treadmill. Even if your horse is too stiff or lame to ride, it still needs exercise. Too much stall rest will only make joints stiffer. Keep your horse moving, so his joints remain mobile. Let your horse roam in a pasture, determining its own pace. However, make sure your arthritic horse is not being bullied or chased by the rest of the herd. Quiet companions are best for the arthritic horse. Keep your horse’s hooves trimmed. When a horse’s feet get too long, the odds of twisting and torqueing the joints increase. Also, think about what your horse is standing on. Appropriate footing provides cushioning but is not too soft. Avoid activity on hard surfaces that will add joint stress. Also avoid steep, uneven and rocky terrain. Watch your horse’s weight. Less activity generally means a higher weight, and more pounds means more joint stress. If your horse seems stiff, call us today. After a thorough examination, we can recommend the best treatment methods to make your horse comfortable and an appropriate diet plan to meet your horse’s caloric needs.